This week the BM Stairlifts team are delighted to be presenting at the local Home Instead Senior Care conference this coming Wednesday. Big thank you to Home Instead for the invitation, we are all looking forward to meeting the dedicated carers and staff at Home Instead. 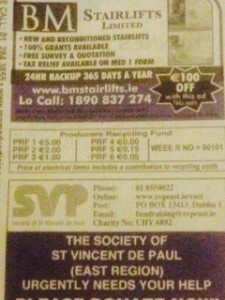 This week, BM Stairlift launched a till receipt campaign with MNM Advertising and one dedicated customer managed to come across our advert in Dunnes Stores on Georges Street. If you haven’t seen our advert, the details are 100 euros off any stairlift installation with a till receipt like the one below!!! Including a free stairlift installation quotation. So, what have you got to lose…..